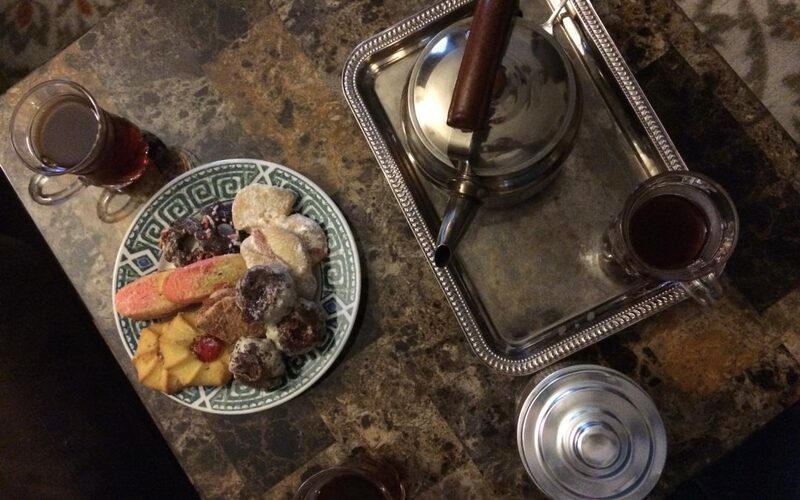 Ziwa Halim places a plate of cookies and a tray with tea glasses on the coffee table. Her 1-month-old baby Adam sleeps nearby, 4-year-old Yusef tumbles around on the couches, and second-grader Huda settles into a seat to listen and to add her two cents. Ziwa’s husband Abbas joins later in the conversation. 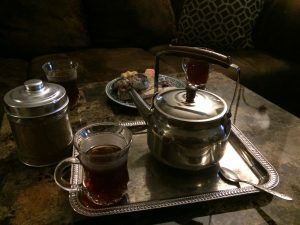 We sip the dark, sweet tea and talk in simple English about their roots and their experiences in making new friends in a new culture. Francesca: Could you tell me about your family and where you are from? Ziwa: I am from Syria, I’m Kurdish. My parents both, they are Kurdish, too. We lived in Lebanon, in Beirut. My husband is from Iraq, and he lived in Lebanon, too. His mother is from Lebanon, but his father is from Iraq. I have three children—one girl and two boys: Huda, Yusef, and Adam. What do you miss about living in Lebanon? Ziwa: I miss the food, my family, my house—everything there! I have my mother, my brothers, and my sister still there. Can you tell me why you came to the U.S.? Ziwa: When Syria had a war, so many people came to Lebanon. And Lebanon…it’s very small, so my husband couldn’t find enough work. Many people were looking for work, so he couldn’t get a good income. My husband and I wanted to go to a different country. We were given refugee papers from the U.N. and they told us they have the U.S., if we wanted to go there. And we had interviews—they asked us many questions before we came. We have lived here now for three years. What do you like about living here in the U.S.? Ziwa: I like…how do I explain to you…I like that they help you if you don’t have a very good job. Like welfare helps us—for health insurance, for food. And I like…how you say it? [searches for a word] It’s like system. Like when you drive, it’s organized. Here they have a system for everything! Like, for example, here, when my baby was born, they sent everything [all the paperwork] in the mail. So, it was very easy for us. I like that. What has been your experience in making friends here? Abbas: The first one [here] was Chris. Yeah, he came to my house when we had been here fifteen days. He came to the door and he said, “Hi, my name is Chris. I speak a little bit of Arabic.” I couldn’t understand when I came—I didn’t speak English. And so he spoke a little bit of Arabic—I understood him when he came. So, he came, and we drank tea together. He said, “Welcome to America.” He said, “I have an English class.” He asked if we wanted any help, like for driving to doctor appointments or anything like that. Ziwa: Church World Services helped us, too—with social security, welfare, and everything. But sometimes they didn’t have a ride for us, so Chris helped us a lot. Abbas: He [introduced] us to Jonathan [and his wife Hannah]. And Jonathan helped us, too. And Hannah. And do you know Ephraim? Yeah, we know him good. He helped us, too. We met him at Chris’ house. What kinds of things would you do with together with Hannah? Ziwa: She’s now like my best friend—I like her very much. We have done many things together. We have tea together. Sometimes we go to the park together. Sometimes when I don’t have a car, she gives me a ride—for shopping or to a doctor appointment. Sometimes she helps me with my paperwork, too. She’s not just like my friend—I like her like my sister. I don’t have family here. What advice do you have for Americans who wish to make friends with someone from a different culture or country? Ziwa: Chris was not scared—he just came! It’s good to have friends from other countries, not to say, “Okay, I just need friends from my country.” You can learn about different countries, different ideas, different cultures, new foods, new opinions, many things! I love it! Great interview. 👌🏼😀 Love the people in it too. I like the interview and love the people in it, too. It will help us to know how to reach out to our international neighbors. This inspires me to make more friends and broaden my horizons even more. Thank you Rachel. We tend to underestimate the value of broadening our horizons don’t we.